Our small complex has been recently stylishly renovated with lifts and a private communal pool. Our luxury apartment is comfortably equipped to sleep and cater for three with a huge sunny terrace (35 M2) including BBQ, every effort has been made to help make your stay in our apartment a very special one. We are located at the end of a quiet and secluded cul-de-sac, where the only noise you may get is the sea at high tide or the odd angry Sea gull!! Only a realistic few minutes stroll to our local beach and village centre., from our terrace you can enjoy the kind of views that stop you in your tracks, totally breath taking scenery of the famous Los Gigantes cliffs, fishing harbour, and across the sea to the islands of la Gomera and La Palma, definitely a home with a difference. If you appreciate fantastic scenery, sunsets and candle lit evenings with a glass of wine! This is the place for you! Don´t forget your binoculars to watch the dolphins from the terrace!! Tiled in marble with bath/shower, WC, bidet and vanity unit. Tastefully decorated with king size sofa nest, selection of DVD´s,CD´s and books are provided for your enjoyment. The apartment is an ideal base for the active wanting to explore the island, and also for those who just want to chill and watch the world go by! We had some very unusual weather for time of year and so we were in apartment more than we would have liked. The apartment inside is not as shown on your site and some of the information is incorrect. However the terrace and balcony were superb when the sun was out! The aparment block and pool are very tired as is the inside if the apartment and as well as all the hills in Los Gigantes, the apartment block is all stairs! We would not return as in our late sixties its just too hilly. The apartment also lacked any local information and some of the information was out of date. The holiday was OK but lots of things could be improved. Thank you for taking the time to write a review , I value greatly all my guests comments and gladly welcome any suggestions to improve. I am so sorry you experienced bad weather during your stay and genuinely feel your opinion is slightly unfair as I believe the unusual lack of sunshine is the real cause of your discontent . I personally take great pride of the standard of my apartment , since the photos taken two years ago I have renewed the sofa , included a grassed chill out area on the terrace and updated the Internet and TV system to include UK and Sky channels which if anything are assets to the apartment not signs of tiredness . Our complex has a lift in good working order so there was no need to struggle with steps. Los Gigantes is a truly magic place with the most amazing views but with the inconvenience of being located on a hill !! Actually most of our island is one big hill , maybe more research on the location before booking would have been of help. comfortable clean rooms.amazing views,scenic location.need to be agile and fairly fit as the walk up and down the hill will test you in the heat.go to lidl's for shopping and get a taxi back.use the pool as it usually empty. Beautiful Apartment in lovely area! Great place to stay and loved the area. Owner was extremely helpful and always on hand to deal with any problems through the handyman on the site. However this did not detract from the place and we loved the hol- would definitely book again!! Had a problem with the shower and Leslie the owner although out of the country got it sorted the same day it was reported. The floor fan and the ceiling fan was a blessing at night as the A/C couldn't handle the heat and too noisy to sleep with it on. We thoroughly enjoyed our 2 week holiday staying in Los Gigantes and would recommend it to anyone who wants to get away from the hustle and bustle of the well commercialised areas on the island. good location, full of equipment & quit apartment. The first thing to say is that none of the other reviews are lying - we stayed at Lesley's fabulous apartment from 21-28 April and did have somewhat raised expectations as the reviews were so glowing! I also work in travel writing, so am quite used to seeing a fair bit of poetic license... however, I have to say that this is without doubt one of the best apartments I've ever stayed in. Lesley really has thought of everything - from the superbly equipped kitchen to wonderfully comfortable beds (it's surprising how often even the big companies get this wrong) to the extra touches of a welcoming bottle of cava, binoculars, candles, sewing kit etc and - my particular favourite - an extra blind over the window in the bedorom to help keep out even more light. Everything was clean and carefully thought of, and Lesley was efficient and helpful right from the get-go of our query. I particularly liked that she asked us to text when we arrived as it was the caretaker's day and off and 'she'd worry' that we'd got there OK and all was as it should be. The view was stunning, especially those breathtaking sunsets, and we did see dolphins with the help of the binoculars! The balcony was a joy to spend time on, we had sun from around 10ish til sunset - loved that swing! - and we found the apartment quiet and the pool peaceful and well maintained. The walk down into Los Gigantes was a delight, though the hill took a little bit of getting used to coming back up - though you soon get used to it, and/or there are taxis. We enjoyed the beach, the lido, and several of the local restaurants, and we'd a hired car before coming (shop around, it was insanely cheap) for visiting Teide and Masca - both quite unmissable. 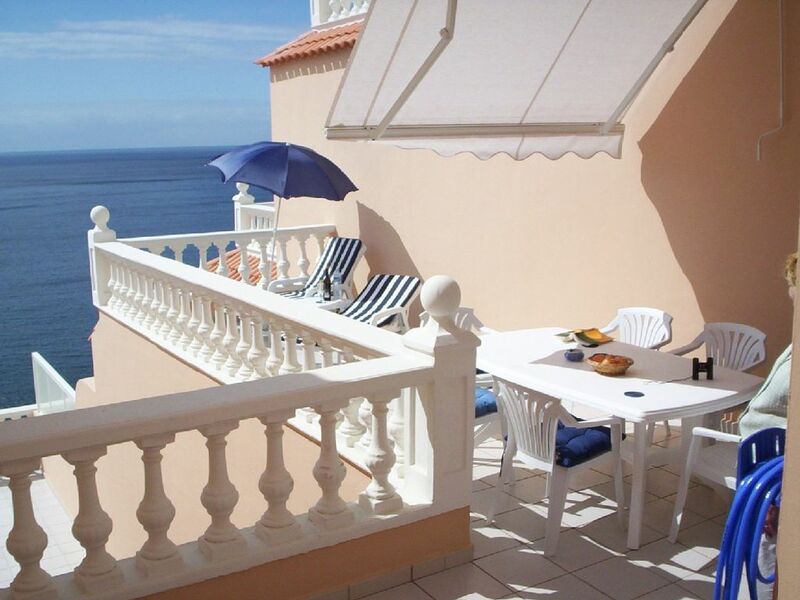 I would absolutely recommend this apartment to anyone - even the most picky would be hard pushed, in my opinion, to find fault - but the best accolade I can give it is to say I've been to Los Gigantes several times over the years, but never wanted to stay in the same place twice. Here, we do actually plan to go back! Los Gigantes is definitely Tenerife´s best kept secret, surrounded by magnificent views, ideal for a relaxing holiday in paradise with a great Variety of quality restaurants,including the harbour where an excellent range of fresh seafood and fish is on offer daily. There are some lovely black sandy beaches in the area and water sports for the more active include, diving, snorkelling, fishing, sailing, boat trips, dolphin cruising or whale watching. 25% charge within ten days of booking balance due four weeks before arrival. We try and be flexible on departure and arrival times, but when fully booked 10 am departure and 2pm arrival. 40 Euros charge for final clean on bookings less than 7 nights Please note the rental of this property abides strictly in accordance with the rules and regulations stipulated in article number three of the Spanish law of property rental.